Piracy was very common, especially during the 17th and 18th centuries, and not just smaller, poorer Stationers yielded to this shady custom, but even large well-established members of the Stationers Company spent some of their working hours on unlicensed printing or the printing of ”overnumbers”, that could be sold by chapmen or exchanged for other books from other printers. 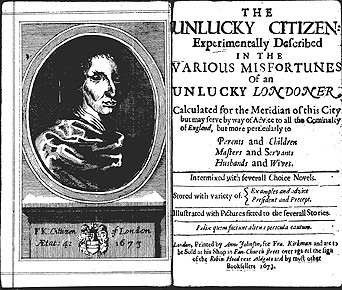 There are, however, fewer depictions in literature of ”press pirates”, their lives and the tricks of their trade, although there is one (or rather two) what you might call Sittenschilderungen from 17th century: Two books by a London bookseller, Francis Kirkman, The Unlucky Citizen Experimentally Described, printed in 1673, and The English Rogue Continued, in the Life of Meriton Latroon, printed 1668 (the quotations hereinafter are from a printing made in 1671). In The English Rogue, the most interesting parts from a copyright point of view are chapters XXII–XXIV, which I have just published at my copyright history site. Book piracy also helped to undermine one of the key concepts one often hears about print as opposed to manuscripts or oral communication: that the edition is a constant which ensures that reliable knowledge is mediated. While hand-written books might differ from copy to copy, the printed edition at least ensured that the text was the same in all copies of the same printing. But both sloppy printers and binders as well as pirates who printed editions that, for instance, might contain fewer pages than the original or a false title page, all of this together made the books of that time less reliable than we may think today, used as we are to practically uniform editions. Adrian Johns writes about this in his The Nature of The Book from 1998 (for instance, p 31-32, 171-173, 183, 188). The English Rogue, chapters XXII–XXIV, may be read here. See also ”Tim Bobbin’s Rap at the PYRATES” from 1773.